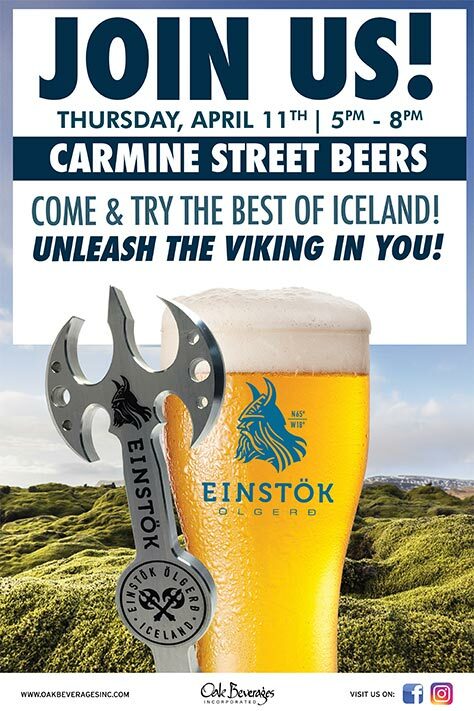 Carmine Street Beers host Icelandic Einstok Tasting - Oak Beverages Inc.
Carmine Street Beers host Icelandic Einstok Tasting, Thursday, April 11th, 5pm – 8pm. Come and try the best of Iceland and unleash the Viking in you! Carmine Street Beers host Icelandic Einstok Tasting, Thursday, Aprill 11th, 5pm – 8pm. The best selection of craft beer in the West Village! Follow us to stay up to date on our tap selections! Find us at 52 Carmine Street. Posted in Featured Promo, Sampling, Tasting Event.